This is a Tedx talk about how linguistics can better inform teaching practices, using the relationship between multi-lingual indigenous children and monolingual English teachers in Australia as an example. While the solutions proposed are quite simple (such as providing teachers with resources about the at-home languages of these children), it just shows how under-informed these teachers can be about where these children are coming from. The talk also briefly addresses the issue of the monolingual argument "These people need to learn English." College Humor showing how trying to fit in with the culture is not always a positive thing. This is titled "British People Attempting Their Best American Accent," which really encapsulates the main point of the video. Essentially, aside from a handful of outliers, the attempts at accents reflected stereotypes that some British people tend to think Americans hold. The accents revolved around "Southern," "Californian/Surfer," and "Hyper-Metropolitan" accents. The words included by those speaking generally reflected stereotypes involving surfing and smoking weed (for the Californian/Surfer), eating cheeseburgers, shopping, and gossip (Hyper-Metropolitan), and drinking beer and shooting guns (Southern). The participants were not asked to do a specific kind of "American accent," either, they merely did an accent that they deemed to be what is "the American accent." How Americans are perceived by these participants was evident in their style of speech and words chosen to reflect typical American conversation along; one could also possibly argue that this reflects that some British people group all of the American identities into one conglomerate identity which they deem to be wholly "American." Thinking about this more outside of the video, I feel that this could be true in terms of how Americans think of other cultures as well, like how Americans think of the British identities. 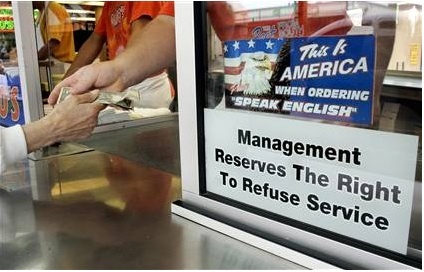 This video reports about an owner of a diner in North Carolina that gained major support when he posted an 'English Only' sign at his door. In this interview the owner claims it started because of it was annoying to him and his staff to have to wait on people that did not speak English. He said it became very frustrating for both parties and eventually the Spanish speaking customers were hostile towards him. When the sign was first put out the diner tripled its business. People from the local community supported his stance and pledged their support for him in there continual attendance. He even said people requested to have their own signs so he made copies and has given out nearly 2,000 signs. What was shocking to me was the national support this man was getting. Celebrity new anchors and various organizations contacted him in support of his stance. One political organization even offered free law support if he were to come into any conflict regarding the issue. I figured something like this would have support, but not nearly to the magnitude it did. What shocked me even more was the lack of push-back he was receiving. He claimed that there was little to none. That being so, it can either show the dominant ideology in America regarding the English Only movement, or the difficulty to organize anti-Engliah Only groups. This artifact is showing how different people communicate on a daily basis, and how each person has a different way of showing how the communicate. With this skit, most of it exaggerated for comical effect. But this is showing the diversity of people and there language through a simple conversation in group settings. In this skit there is gender rolls being played of femininity and masculinity, while showing the differences within the women's language. And how this "Art of the Pick-Up" class is teaching women how to properly express themselves. The coke ad from the 2014 Super Bowl, in which "America the Beautiful" is sung in multiple languages. This ad sparked much internet controversy related to the U.S.' ideology of monolingualism. 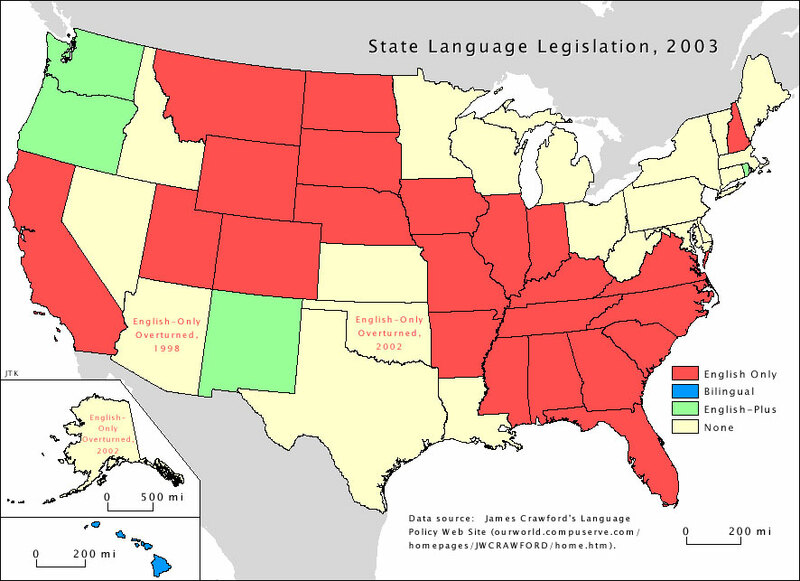 James Crawford's map from 2003 showing those states that have adopted English-Only legislation. The official website of U.S. English, the oldest citizen's action group dedicated to making English the official language of the United States. A 2013 article on slate.com documenting the removal of the U.S.'s only written rule from a state prison limiting the language used during prisoner visits to English only.